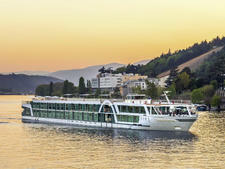 Offering flexible and competitively priced river cruises, Amadeus Brilliant was launched in 2011 and is the sister ship to the near identical Amadeus Elegant. 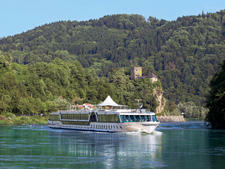 The 150-passenger vessel is part of the 14-strong and steadily growing Austrian-owned Amadeus River Cruises' fleet, which launched a new ship in France in 2017 and will expand again in 2018 with the addition of another European ship. 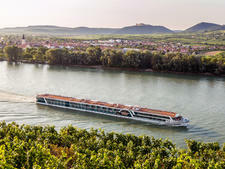 Although Amadeus -- not to be mistaken with AmaWaterways -- is not as well-known as some of the big river cruise names, it is one of the oldest river cruise companies in Europe. 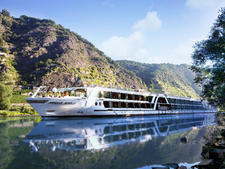 Martina and Wolfgang Lueftner launched river cruise vacations more than 30 years ago, and in recent years the family-owned company has been marketing its cruises in the U.S., U.K. and other countries. English is the main language onboard. In addition to boasting amenities such as a hair salon, massage room, gym and late-night snack, which are not widely available on the majority of riverboats, it also offers some unusual cruises. One of its first itineraries was to the little-known Danube Delta, at the mouth of the Black Sea, and today it remains one of very few lines to offer this journey. The elegant vessel has 68 cabins and eight suites, and the majority have panoramic windows that open onto French balconies. It also has two single cabins, another relative rarity for riverboats. 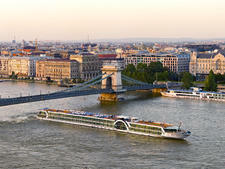 Most river cruise operators include a daily shore tour. Amadeus bucks the trend with its a la carte excursion program, which results in value-for-money fares. Passengers can choose how much, or how little, they want to do and buy land tours individually or as part of a variety of packages. 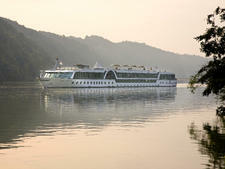 (On group bookings, a number of excursions are generally included in the fare). All crew members speak English and are unfailing cheerful, friendly and attentive. As Amadeus Brilliant carries fewer passengers than some other vessels of the same size, it has an intimate onboard atmosphere with a high level of personal service. 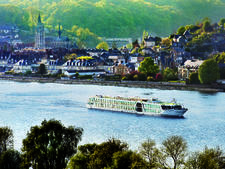 Amadeus is the only European river cruise line to be awarded the Green Globe certificate for sustainable travel, which requires companies to demonstrate energy and water-saving measures, plus ongoing ecological awareness in everyday routines. 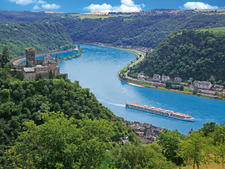 Amadeus Brilliant sails on a variety of itineraries on the Rhine, Danube and Moselle. The folks you will meet onboard are an extremely cosmopolitan mix. Unlike lines that predominantly cater to the North American market, Amadeus passengers are multinational and come from throughout Europe and further afield. This makes for a really interesting and diverse atmosphere, as you're able to chat with folks from different parts of the world. Our fellow passengers came from the U.S., U.K., Germany, France, Holland and Belgium -- mostly 55+ and seniors -- it was fun getting to know them. Amadeus attracts a lot of groups, but there were also couples and solo travelers. Amadeus does not have a dress code, although passengers are encouraged to dress "smartly" for dinner. It is noticeable that people tend to dress up more in the evening than is the norm on river cruises that mainly cater to North Americans. The guideline is "semi-formal or smart-casual" for special occasions such as the weekly captain's gala dinner. In general men wore collared shirts -- some with jackets and ties -- for dinner, with dresses, skirts, pants and smarter tops for the ladies. Jeans, shorts and casual trousers are acceptable on shore excursions, and comfortable shoes are an absolute must for negotiating the cobblestones and uneven surfaces in some cities. The weather in Europe is changeable, so it's always advisable to bring layers, some form of headgear, sunglasses and a raincoat. Umbrellas are provided onboard. Amadeus fares include red and white wine, soft drinks and coffee with lunch and dinner. There is a complimentary 24-hour self-service tea and coffee station in the Amadeus Club at the aft of the ship. Cruises begin with a welcome cocktail, and complimentary cocktails are also served at the captain's gala night. Glasses, rather than bottles, of water are freely available in the Panorama Lounge. There is an included early morning stretching class on the Sun Deck and passengers can use the five complimentary bicycles on a first-come, first-served basis. These come with a helmet and a lock. All excursions feature audio headsets that are provided in every cabin. The onboard currency is the euro. Gratuities are not included in the fare and the recommended guideline is 5 to 7 euros per person, per day. At the end of the cruise, there is a tip box left at reception, with envelopes for gratuities left in the cabin. Passengers can also tip individual members of the crew directly for outstanding service. Although it is not common practice with European passengers, North Americans might want to carry some small denominations to tip local guides and shore excursion bus drivers. 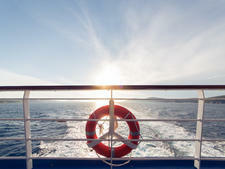 Some cruise packages include complimentary bottled water, replenished daily, and Wi-Fi. So check at the time of booking.